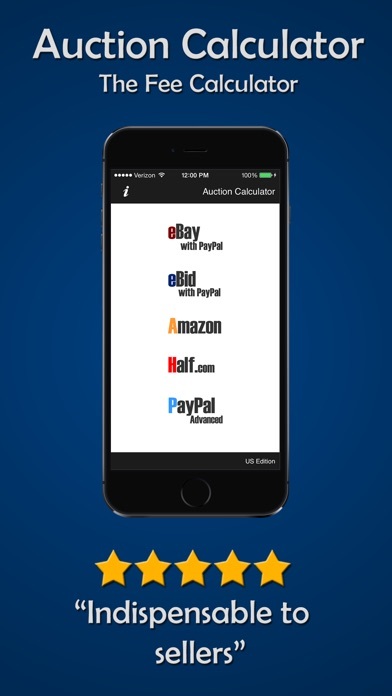 Auction Calculator - US Edition is a comprehensive and user-friendly set of fee calculators and “reverse” calculators for 5 top auction sites: Amazon, eBay, eBid, Half.com and PayPal. We created this app to help you save time and money. The fee calculators provide you with all the tools you need to calculate fees for all combination of listing upgrades, categories and auction types, while the reverse calculators let you know the minimum price at which you need to sell your item in order to make your desired profit. The Professional Edition contains additional features over the Standard Edition geared toward Professional eBay Users with features, such as eBay Store Settings, eBay Motors & Property, Multiple Items in One Listing, Reverse Calculators & UI Enhancements. This app is universal. It includes an iPad & iPhone version, which means you get two applications in one. It also includes Retina Display textures. The clean, crisp high-resolution textures make the application look stunning. 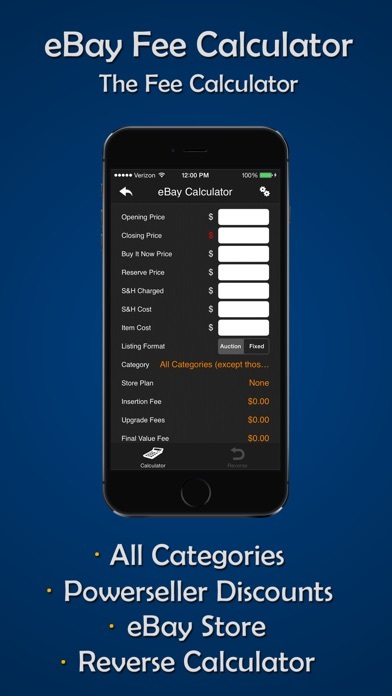 * The app currently has the May 2017 eBay changes, this app only provides US Site Calculators & requires iOS 8.0+. The eBid with PayPal Fee Calculator allows you calculate the fees for an eBid listing given the closing price, item cost, and shipping costs. This calculator also contains an eBid Reverse Calculator which lets you enter your desired profit and quickly calculate your optimal selling price. 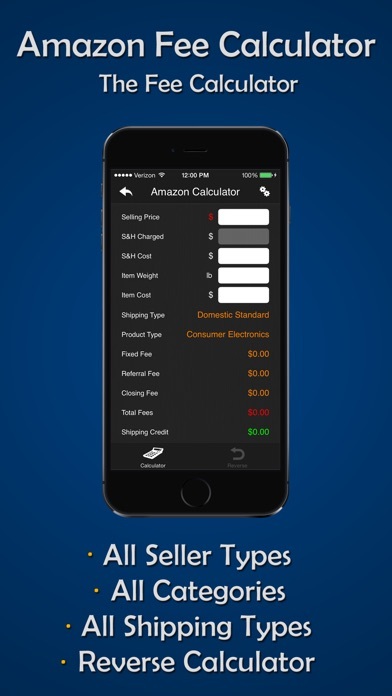 The Amazon Fee Calculator allows you calculate the fees for an Amazon listing given a closing price, item weight, item cost, shipping cost. This calculator also has an Amazon Reverse Calculator which lets you enter your desired profit and quickly calculate your optimal selling price. 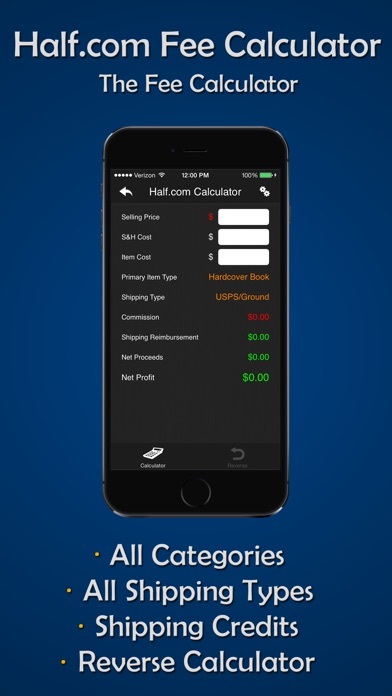 The Half.com Fee Calculator allows you calculate the fees for a listing given a closing price, item cost, shipping cost. This calculator also has a Half.com Reverse Calculator which lets you enter your desired profit and quickly calculate your selling price. The PayPal Fee Calculator allows you calculate the fees for receiving a payment from someone locally or internationally. The PayPal Reverse Calculator lets you enter your desired payment and quickly calculate the amount you need to be sent in order to receive that desired payment. Please email support@logicworks101.com with suggestions for future features, improvements or bugs. Auction eCalc - "for Ebay Paypal Profit Calculator"